His research interests focus on all things Russian and places “where the Russian boot has trod” (Nicholas II) in the former Soviet Union and the former East Europe. He started off studying workers and the Communist Party, moving on to broader questions of economic policy in the socialist and post-socialist economies. Along the way he developed an interest in nationalism and ethnic conflict. Since 2013 he has been editor in chief of Nationalities Papers, the journal of the Association for the Study of Nationalities along with serving as associate editor of Russian Review. 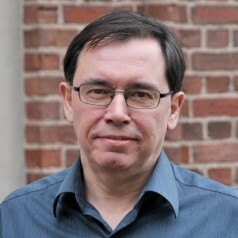 He has written two books, "The Politics of Economic Stagnation in the Soviet Union" (Cambridge University Press, 1992) and "The Myth of the Plan: Lessons of Soviet Planning Experience" (Hutchinson, 1985); and edited a third, "Business and the State in Contemporary Russia" (Westview Press, 2000). Recent articles cover topics such as Russian foreign policy, the failure of Russia’s democratic transition, and the political economy of Russia’s oil and gas industry. In 2011, we organized a conference at Wesleyan on the theme "Looking Back at Brezhnev." The papers were published in Russian History 43.3 and Russian Review 73.2. He was a visiting Fulbright professor at the European University in St. Petersburg in 2000 and at Sophia University in Tokyo in 2003. From 1995-97 he was on leave from Wesleyan and served as assistant director of the Open Media Research Institute attached to Radio Liberty in Prague. He was a visiting fellow at the University of York in 2014 and at the Center for European Studies, Australian National University in 2015. He won a grant from the Leverhulme Trust grant to spend 2016 as a visiting professor at the University of Manchester, working on a project entitled “Visualizing the nation.” This aims to explore how political nationalism has expressed itself through visual media – film, television and the internet.